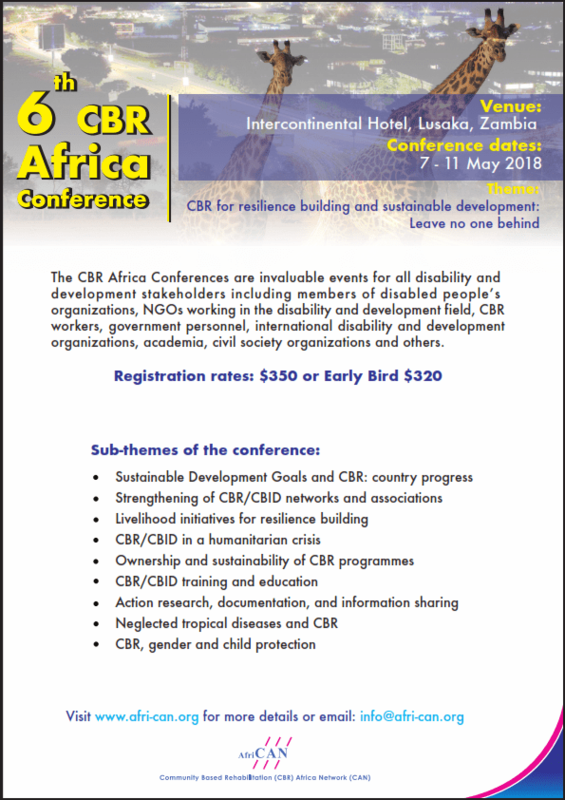 The CBR Africa Conference is aimed at all disability and development stakeholders, including members of disabled people’s organisations, NGOs working in the disability and development field, CBR workers, government personnel, academics, civil society organisations and more. The conference is important in shaping the direction CBR as a strategy is likely to take in the coming years as it offers opportunity to stakeholders to share, discuss and forge ways forward in relation to the challenges, lessons and opportunities in implementing CBR as a strategy for inclusive development in Africa. It is anticipated that the conference will generate a variety of analytical papers and presentations in relation to the sub themes (see sub themes below). All papers presented at the conference will be summarised in a conference report and posted on the CAN website; and later they will be published in a book. Additionally, the conference is expected to stimulate public debate and discourse on the implementation of CBR and a possible transition to CBID (Community Based Inclusive Development). Delegates will discuss success, challenges and opportunities implementing CBR in Africa. The conference is expected to give a greater publicity to the current CBR issues under discussion in relation to WHO CBR guidelines, the Convention on the Rights of Persons with Disabilities (CRPD) and Sustainable Development Goals (SDGs). It will mobilise efforts towards ensuring equalisation of development opportunities for persons with disabilities.